But she pivoted almost immediately from talk about her certificate to talk about her frustrations. “I would have made more progress if my livestock had done better.” Her goats’ first two litters died. The two she now has just had another litter of two kids each, and though one of the four kids died, the others seem healthy, so she can be cautiously hopeful. She and her husband also have a pig that gave birth to six piglets. And if they survive they will provide a windfall. As she talked about the livestock, and about other aspects of her experience in the program, she was frequently interrupted by her husband. He would jump in, then I would ask her to continue. But his interruptions would change her focus, adding to the confusion that my questions sometimes initially provoke. He’d insist that she didn’t know anything about their livestock, that he was the one who took care of the animals. The couple’s plans moving forward are a little unclear. Two of their three children no longer live with them. 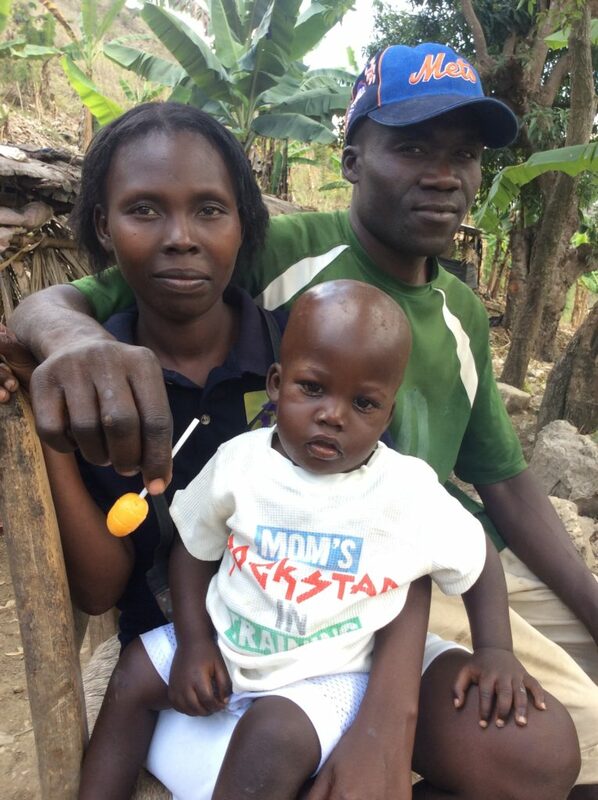 Both Rosemitha and Patekwe brought children into the relationship, one each, but his daughter now lives with a cousin in Lakolin, near the hospital where his mother died. The cousin encouraged him to leave the girl with her while the older woman was sick, arguing that she’d have better access to an education. Patekwe visits regularly, and he’s happy with his daughter’s new situation. Rosemitha’s boy has moved in with her father, who lives nearby. Rosemitha is glad to have someone living with the older man, but her decision was also affected by her sense that her boy had grown less welcome with Patekwa than he had been when he was a younger brother and a playmate for his girl. Rosemitha says she wants to return to small commerce, and she knows she can sell a goat to get the money to do so, but neither she nor her husband think it’s time to do that yet. And she and Patekwe will have to decide who will look after the child if she starts going to the market regularly. His mother’s boyfriend would spend time with them at first after his mother died, but he’s moved on to another woman. They aren’t seeing him much anymore. In addition, what Rosemitha has told me in the past, but will not say in front of Patekwe, is that it is hard for her to sustain a business around him. When he is focused on farming their land – he inherited the plot above their home from his mother, and has been renting another for a long time – he doesn’t have time to earn cash by working for other farmers. So, he turns to any cash she might have to manage his expenses. When he isn’t busy, he likes to hang out in the market in Kaledan, down the road from where they live, and that involves having money in his pocket for gambling and snacks. She graduated with six goats, including two young kids, but she already used one to make an investment. Her husband was preparing their land for planting, and they needed the money to buy seeds. The goat sold for 3000 gourds, or about $48, and she was able to buy seven large cans of beans. Her boar is starting to grow. She bought a small one when she collected the money that was owed her for the meat from a goat that died. It wasn’t much, so she had to buy the smallest, least expensive pig she could find. Now she’s eyeing the right moment to sell it and replace it with a sow that can give her offspring. Her family’s medical issues persist, however. Unfortunately, our team was not very successful at helping her learn how she should follow up. One of her sons was diagnosed with a hernia, but he missed the follow-upappointment at the Mibalè hospital. Idalia says that he was waiting for a phone call, but the boy lives in Mibalè, near the hospital, and he knew the date. Her youngest son’s situation is more complicated, but also not good. He has a condition that leads him to produce too many red blood cells. His blood ends up getting too little oxygen, so he’s short of breath all the time. The only treatment is regular removal of some of his blood, and we helped Idalia get him started down that road. It appeared to help. But Idalia and her husband are convinced that “they took too much blood,” so she isn’t bringing him back for further procedures. And the boy is very short of breath again. And things are only going to get more difficult. Idalia and her husband are committed to leaving Gwo Labou, where they’ve been living since just before our team met them. They want to return to Jinpaye, but Jinpaye is even farther into the mountains, with more difficult access to care, than even Gwo Labou. Even if Idalia was inclined to get her boy the treatment he needs for his blood condition, she wouldn’t be able to find it anywhere near where she plans to go. The family had originally fled from Jinpaye when they got into a conflict with neighbors about the rightful owner of some plantains. When we met them, they were living in a small space within a cousin’s home. The cousin himself eventually gave them the very small plot of land they built their house on. But they feel as though they have no future in Gwo Labou. The cousin who gave them land to build on clearly wants them gone now that the program is over. Last year, he let them plant a very small garden around their house. This year, he planted his own crops to within ten feet of their front door. And with no land to farm, life is simply too expensive. Idalia’s husband has taken to traveling back and forth to Jinpaye to farm their land there, but that means he has to spend days at a time away from his family. They don’t yet have the money they’ll need for the move. Their old house needs extensive repairs. But between their livestock and the crops they are planting in Jinpaye, they expect to be ready by the beginning of next year. This entry was posted in Chemen Lavi Miyo, The Women of Kolonbyè on March 21, 2018 by Steven Werlin. She came down with a fever right after graduation, and she was still feeling sick a week later, but she was cheerful as she spoke of the day and of the completion of her CLM experience. “Everything they gave us is really ours. They are leaving, but they didn’t take back anything that they gave us.” It was as though she had doubted whether what she received was really hers even until the last moments. She’s been struggling to take good care of the livestock she acquired since she joined CLM. One of her goats had a kid, but her pig died. “I need to save enough money to replace it.” She bought a pair of turkeys, but someone stole one of them. The one she still has is nesting, though, so she may have more soon. But Louisimène’s most important activity is farming. She and her husband work together. They lost their last crop of beans when the rains came at the wrong moment for them, but they have a small field of plantains that is producing well. It gives them something to eat, but also something to sell. Having something to sell is important because Louisimène doesn’t want to get into small commerce, and she and her husband need cash sometimes, especially since their girl is finally in school. Keeping her in school has been a struggle. She missed some time when her school fees were overdue. But Louisimène is up to date with the payments now, and she’ll be able to send her girl back to school as soon as the Easter vacation is over. Miramène’s journey through CLM was somewhat unusual. She left Gwo Labou, where she lives and where she was part of the program, for three months. We don’t often have members who have such large gaps in their experience. She was sick with persistent diarrhea. 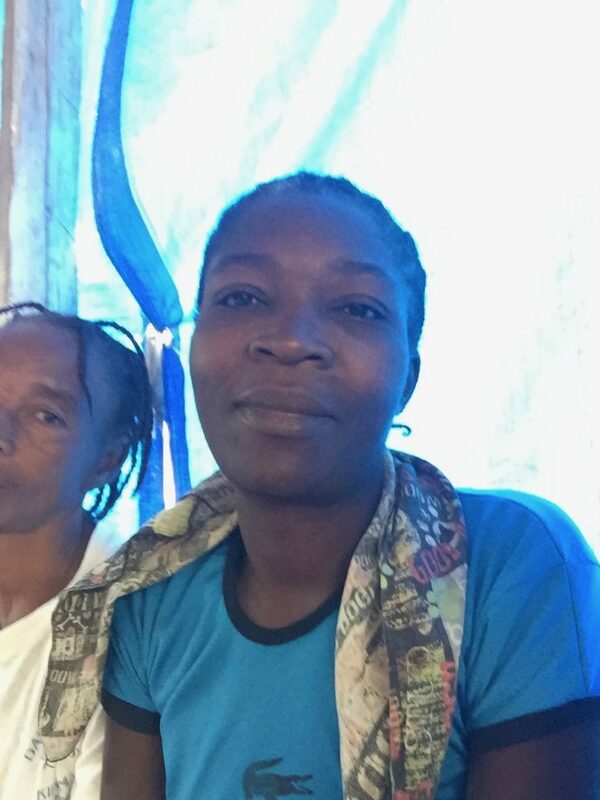 Her family took her to the government health clinic in Savanèt, where she was told that she had cholera. She was sent to the cholera treatment center there. She never went, however, because she was convinced that cholera wasn’t her problem. Instead, she went to the home of a medsen fèy, a practitioner of traditional herbal medicines. 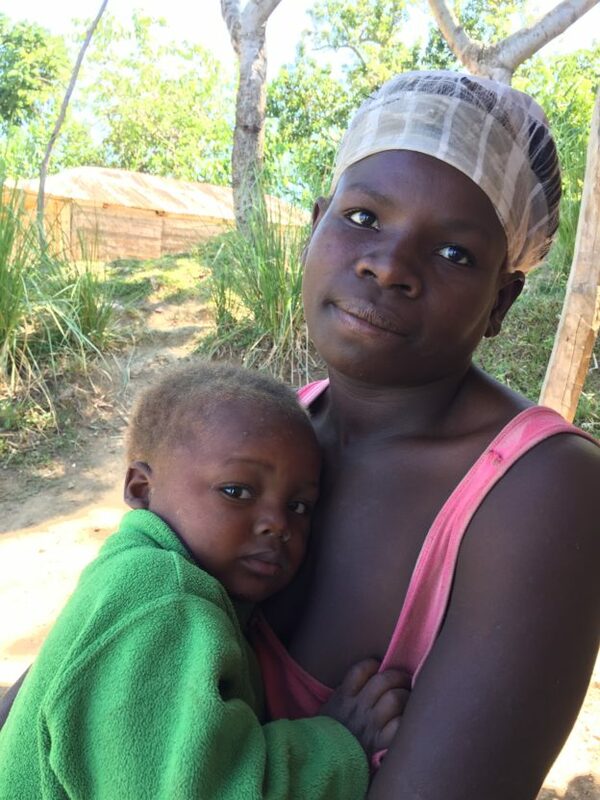 She stayed with him for weeks until the diarrhea was gone, drinking herbal preparations, then she left for Port au Prince, where she stayed with a cousin while she regained her strength. While she was away, her case manager Ricot worked with her mother. The older woman took care of Miramène’s livestock. Miramène lives in a lakou with three houses in addition to hers: her parents’ and those of two sisters. 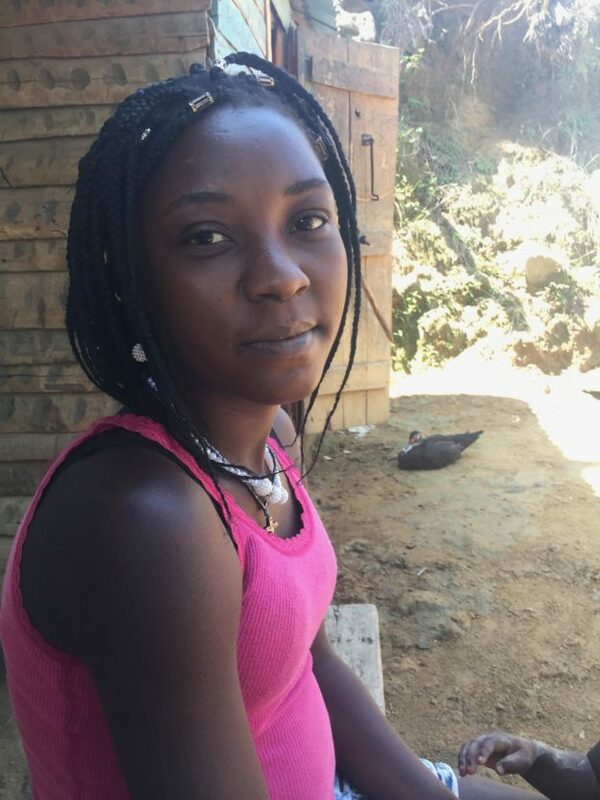 One of the two sisters also qualified for the CLM program, so it was easy for Ricot and the other case manager to stay on top of the situation. When Miramène was finally strong enough to come home, her assets were all in place. Though her goats didn’t increase, her pig had three piglets. She was also able to buy ducks and turkeys. She even added a cow to what she owned. The cow is especially interesting because it has nothing directly to do with the CLM program. The father of her little girl, who lives in the Dominican Republic, bought it for her during one of his visits. And his support for Miramène is probably worth dwelling on. It turns out that he was willing and able to do a lot for Miramène and their girl. She was, for example, the first CLM member in her neighborhood to finish work on her house. The man heard about the opportunity, and he came to Haiti long enough to help her through the process. And then he gave her an expensive cow. This makes you wonder why Miramène was a CLM member in the first place. With a strong family structure in place where she lives and substantial support from her girl’s father, she might have been okay without the program. But we couldn’t have known that. At the time she joined CLM, she had been without the man’s support for some time. As she explains it, he was living with his wife in the Dominican Republic, and the wife was pregnant. He focused all of his support on his pregnant wife. So, we took Miramène into the program. At the time, the case managers who selected her probably felt that they had no choice. Even after 18 months, it is still hard to talk with Juslène. She’s friendly, even cheerful, and she’s happy to chat. She seems excited to see me whenever I come by. But she just doesn’t have much to say. I ask her about graduation, and she says it was “bèl,” which can mean pretty or good, but when I ask her what she liked about it she says she doesn’t know. That’s just one example. A cheerful “m pa konnen,” or “I don’t know” is her answer to most questions, at least her initial answer. She can’t say what about the graduation she enjoyed except to say, “because I graduated,” nor can she say what about it is important to her. As her boy fumbles around in my bag, I ask her how old he is now, but she doesn’t know that either. She can remember only which local children were born before him and after him, and with that information a neighbor concludes that he’s probably four. She plans on going to the final meeting of her Village Savings and Loan Association later on the day of my visit. It is an important meeting because she’ll receive the savings she accumulated through the year along with the interest it earned when association members repaid their loans, but she doesn’t know how much she’ll receive. She won’t even hazard a guess. She does, however, know what she plans to do with the money. It’s planting season in Kolonbyè. She’ll buy black beans, which is an important cash crop in the area. The farming she does with her partner is crucial to the family’s well-being since her livestock never really flourished within the program and she never started a small commerce. Though she lists the goats and the pig she was given as the program’s most important elements, she didn’t succeed with either. We gave her two goats, and she graduated with two goats. We gave her a pig, and she graduated with a pig. All she was able to accumulate was some poultry: a turkey and two ducks. Most of the couple’s wealth is in their farming. And their lives have changed. When she joined the program, she was living in the corner of a room in her sister-in-law’s house. Now she has a little house all her own. A plank nailed across two short posts that were driven into the earth next to her home’s front door serves as a bench, and she loves to sit there and chat with passers-by. It leaves me wondering what she says to them. More important, however, is the transformation of her boy. When she first joined the program, he was badly malnourished. He was thin and mostly lifeless in her arms. 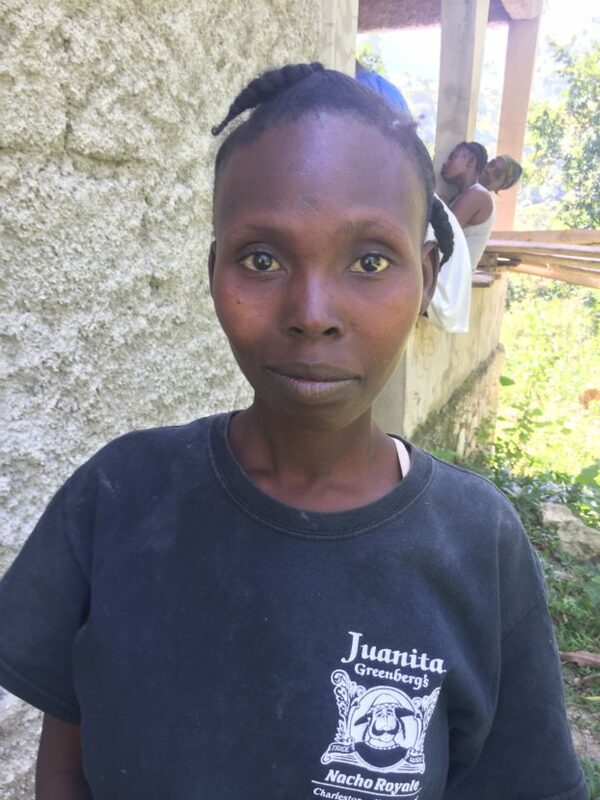 The CLM nurse referred him to the local government health center for evaluation, and provided a transportation stipend to ensure that Juslène could get him there for regular appointments. 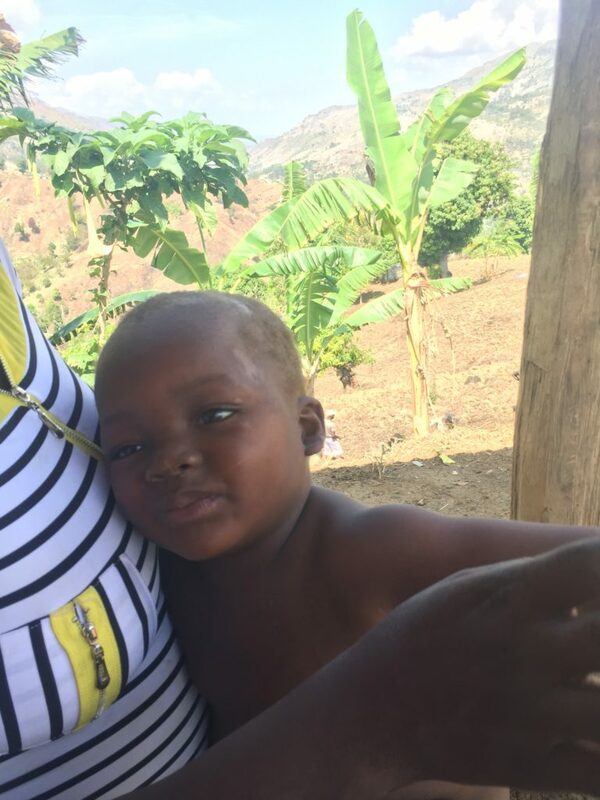 Her was treated with fortified peanut butter, the standard treatment in Haiti, and now seems like a different boy. He’s curious, getting into everything. He maintains a constant banter. His development seems a little bit behind. Very little of what he says is clear to anyone but his mother, who talks with him constantly as her case manager taught her to do. This entry was posted in Chemen Lavi Miyo, The Women of Kolonbyè on March 20, 2018 by Steven Werlin. Fonkoze’s Chemen Lavi Miyò, or Pathway to a Better Life, program is more than ten years old. And it’s been almost eight years since three of my Haitian colleagues and I spent a month in Bangladesh, learning the program from its creators at BRAC. That BRAC team would still recognize its work in all that we do, but the program has changed over the years as we’ve tinkered with it whenever we come upon what looks to be a way to make it stronger. Over the last couple of years, the most important change has been the introduction of Village Savings and Loan Associations. (See: www.vsla.net.) CLM members attend weekly meetings, where they can buy from one to five shares of the association. The money they buy their shares with becomes capital that members of the association can borrow. They repay the loans with interest, so the capital grows. At the end of a year-long cycle, the association breaks the bank, distributing the capital among members in accordance with the number of shares they have purchased. This morning I attended the final meeting of the year of a VSLA in Fon Desanm, a mountain community that lies a short hike upward from the main road that leads to Savanèt. The meeting took place in a small church., really just rough timber support posts covered by a tin roof and enclosed by walls of straw. There were a handful of narrow, wooden benches fixed into the packed dirt floor along the walls of the church and a table in the front that held the various things the meeting required. About 35 CLM members had been buying shares for 50 gourds – about 80 cents – and together had purchased 160,150 gourds, or almost $2,600, worth over the course of the year. They were very excited about the payout. The return on their investment came in several forms. Members paid 2% interest per month on their loans and penalties for late payments. An additional fund, comprised of small weekly donations to be used to help any member who confronts an emergency, like a death in the family, was folded into the total. Taking it all together, the members accumulated more than 200,000 gourds that they need to separate among them. That’s about 25% more than the value of the shares they purchased. The pay-off meeting actually took place in two sessions on consecutive days. On the first day, the association’s leadership, along with Martinière, the CLM case manager responsible for working with the Fon Desanm VSLA, counted and recounted all the shares that had been purchased. Each member has a small booklet with a star for every share she bought, and the association’s secretary keeps a notebook that lists all the share purchases by week. The two records are compared in the presence of the entire membership so that each member know what she and her fellow members have accomplished. Members repaid outstanding debts. Those who had debts they could not repay with cash repaid them giving back shares. There were five such women, and four of the five were able to clear their debt with about half of their investment or less. Many of the women came early to the second day’s meeting, excited to find out how much money they had made and to receive the payout. There were only a few stragglers. It was a social occasion. The room was noisy, as the women chatted with one another. Martinière and the association’s leaders first counted all the cash. The total was 203,132 gourds. They subtracted a small sum that the group will need to restart the association for another one-year cycle. They’ll purchase new savings booklets and notebooks for record-keeping. They then divided what was left by the number of shares – 3,203 – to calculate the final share price, just under 63 gourds. They then called the women up, one at a time, to receive their payout, counting the cash out carefully in front of her. VSLAs need trust to function, but that trust is built on transparency. Marie Yolène had purchased 107 shares over the course of the year. She had also taken out two loans, each for 3,000 gourds. The first helped her pay her children’s school fees, and the second she invested in farming. Paying them back was difficult, but she managed. She plans to use her payout for farming. She has agreed with a neighbor to rent a plot of farmland, and most of her money will pay that rent. But she will have enough left over to buy the seeds – beans, pigeon peas, and corn – that she’ll plant. Rosana was very happy about the VSLA, too. She has big plans for her money. 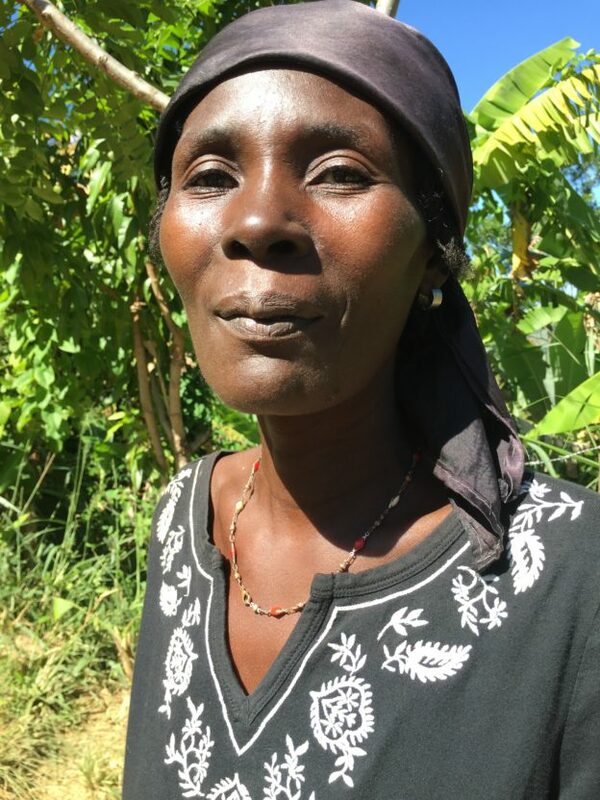 She and her husband have a house full of children, and 2017 was difficult because when it came time to plant, they didn’t have the resources to put in any crops. They had to figure out how to feed the kids for the year with whatever cash they could earn. He did day-labor when he could find it in their neighbors’ fields, and she managed a small commerce. Part of the VSLA’s value for her was that it gave her access to credit to restart her business each time she ran through her capital. Not all the members of the VSLA are CLM members, or even women. The associations would be hard to build with CLM members alone. Too few are literate enough to do the record-keeping that the associations depend upon. Our solution is to bring members of the community’s village assistance committee into its VSLA as well. We organize these committees everywhere we work. They bring community leaders into the program as volunteers. Committee members bring an additional level of personal support and supervision to program members. Adding them to our VSLAs achieves two goals. On the one hand, they can provide literate staffing of critical positions. On the other, they establish an activity that CLM members and community leaders can share that is beneficial to both. He thinks that the VSLA really helped the poorer members of his community. “It really protects them by giving them a way to save and to borrow.” He saw the way some of them struggled to repay their loans, but was pleased that they somehow managed. He and one of his sons were the group’s two leading savers. They each bought 257 shares, which was about three times the average for the 38 members. And he’s anxious to get the next cycle started. “We’d start again tomorrow if we could.” He says that a lot of his neighbors are waiting to join as soon as the group is ready. He and the group’s leaders were not the only men present at the meeting. Wisnel came in place of his wife, who still spends most of her time at home with their infant. He took over attendance at the meetings from her as her pregnancy started to make it hard for her to get around, and continued after she gave birth. The couple’s experience in the VSLA was mixed. They took out one 3000-gourd loan, and it did not go well. 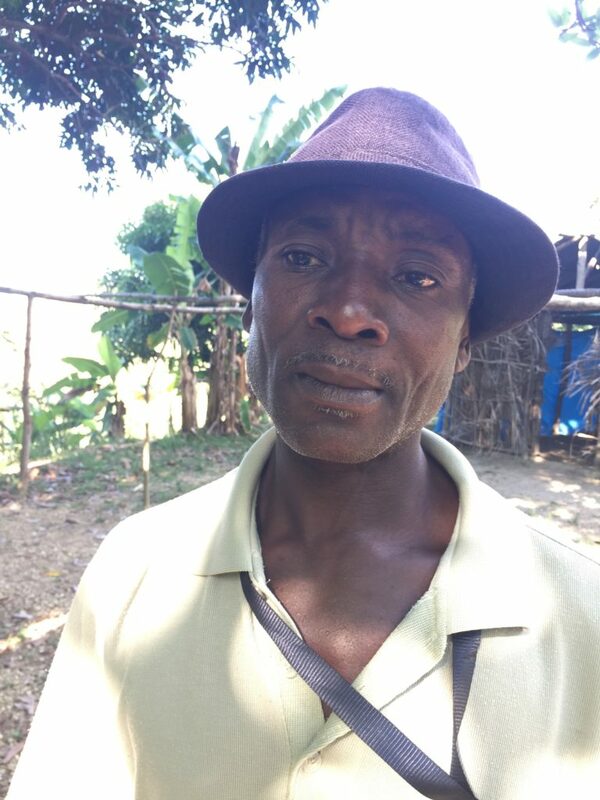 Wisnel bought an avocado crop with the money, but a passing hurricane destroyed most of the crop while it was still on the tree, and the remainder rotted before it got to market when the truck he loaded it onto broke down on the long, bad road to the main highway. He and Modeline eventually had to reach into their savings and sell a goat to pay the debt. Our program, and the communities we work in, still have a lot to learn about VSLAs. To this point, we find them functioning well when case managers take a strong hand in guiding them. Martinière’s leadership was evident throughout the meeting. They have run into trouble in places whether our case managers have decided to stay farther in the background. So we don’t yet know enough about how they function once the case manager leaves, after the CLM members graduate from our program. If we discover that the associations continue to need the program’s support to function well, we’ll need to choose between figuring out a way to provide it and letting the whole promising enterprise drop. This entry was posted in Chemen Lavi Miyo, The Women of Kolonbyè, Uncategorized on January 31, 2018 by Steven Werlin. Rosemitha and her husband have been unhappy ever since his mother passed away. They both feel her loss keenly. They loved having her around. 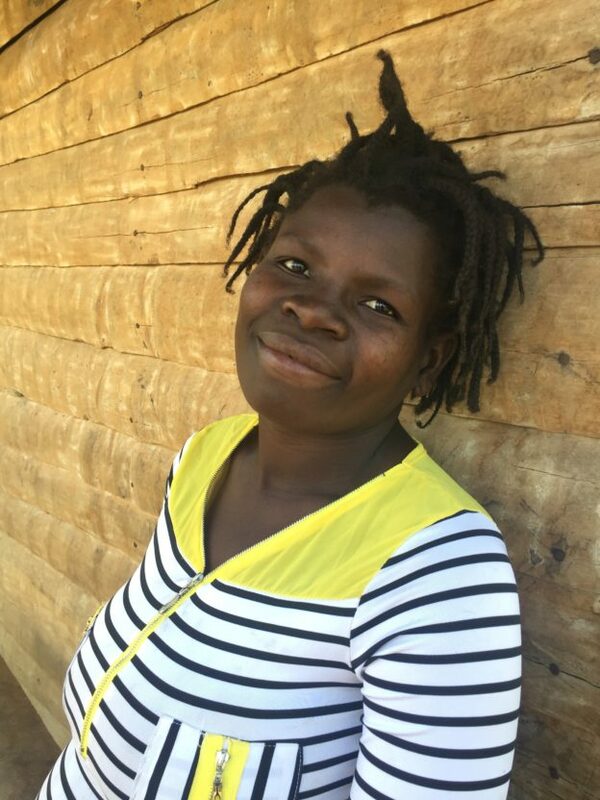 To Rosemitha, she was a second mother, having accompanied her through her pregnancy while her husband was away working as a field hand in the Dominican Republic. And their loss is more than emotional. The older woman was an important member of their household. A trusted babysitter, beloved by her grandchildren, she made it easy for Rosemitha and her husband to go off and engage in their various activities, and her willingness to share domestic chores lightened the couple’s burden of work around the house. Her sickness and subsequent death was also expensive. The CLM program made a standard contribution of 5000 gourds to offset funeral expenses, but the couple still owes the coffin maker 7500 gourds – about $120. The coffin cost 10,000. 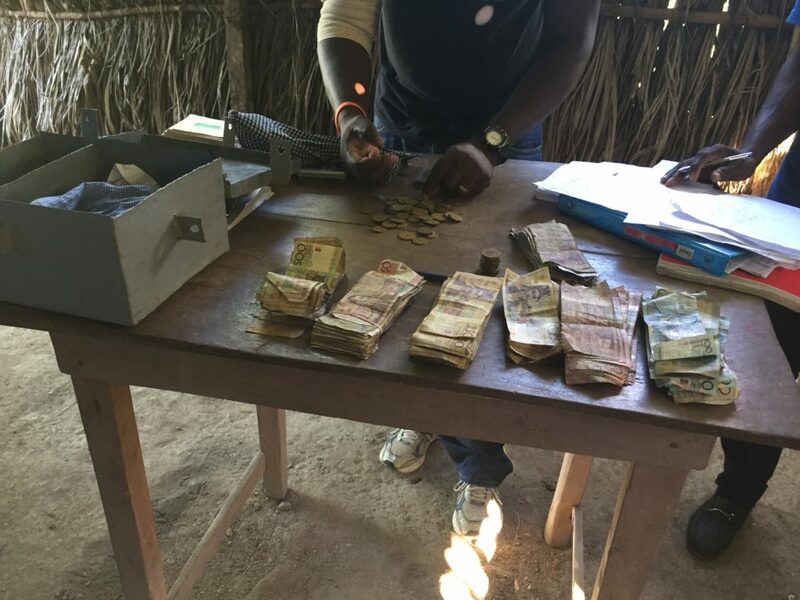 They gave the coffin maker half of the CLM money, and used the other half to pay off the various expenses they incurred entertaining their neighbors during the wake. Their goats have been slow to multiply. Two have had litters, but the kids did not survive. Once again, two are pregnant, but they’ve learned not to count too surely on the results. But normally, they would have their pig’s litter of piglets available to them to pay down their debt and invest in new opportunities. They’ve had good luck with their sow. But the expenses associated with the older woman’s illness cost them the opportunity to use the piglets to make progress. They had to sell the whole litter before it was even born just to manage the expenses that helped the older woman pass through her last weeks of life. So, they’re waiting for their sow to ween the piglets so that they can breed it again. Rosemitha would like to get back into small commerce. She had felt good about her success at it, and the daily income really helped the family. It enabled her husband to focus on farming without having to worry about bringing in something every day. With the Fall bean harvest approaching, there will be opportunities for those with the cash to buy beans directly from farmers and the energy to get them to market. Rosemitha still has savings from her cash stipend that she could use as her investment, but she’s not sure about the energy. “Ever since my mother-in-law passed away, I feel weak.” In the past, she has carried most of her merchandise on her head to the places where she can find trucks to get it to markets, but right now she doesn’t feel as though she has the strength to do so. She doesn’t worry about her home’s immediate needs anymore. She and her husband have food enough right now from their own fields. But they will have a lot to do to get themselves back onto the path forward, and right now the steps they need to take seem to feel as though they are too great. This entry was posted in Chemen Lavi Miyo, The Women of Kolonbyè on November 5, 2017 by Steven Werlin. Idalia hasn’t been feeling well. She says she’s had a cold and a fever. She’s been coughing a lot, too. 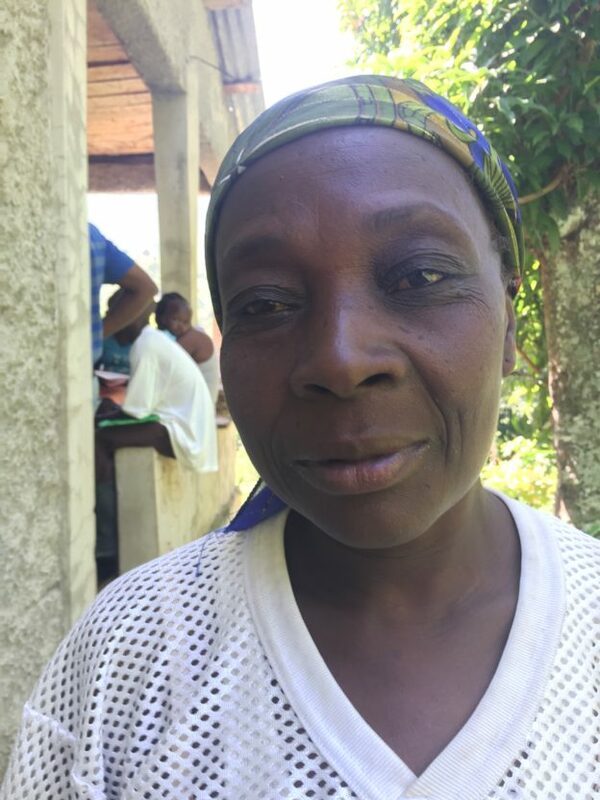 She went to the Hospital in Mirebalais to see a doctor, but did not plan her visit through our CLM nurse, and she was not able to get herself seen. The hospital sees many more people every day than it was designed to serve, and getting to see a doctor can be complicated. It might be simpler for her if she went to the clinic in Lakolin. It too is part of the Partners in Health network, and though it lacks the range of specialists that the Mirebalais facility’s role as a teaching hospital gives it, the lines can be much shorter and the procedures simpler. But Idalia prefers Mirebalais. Her oldest son lives there, and one of her younger ones spends most of his time at his brother’s house. Going to Mirebalais gives her a chance to see them. And now she has an exciting new reason to do so. Her daughter-in-law just gave birth to Idalia’s first grandchild. Idalia used the occasion to spend some time with the younger couple, helping out. She and her husband are nearly finished with their small home. They need one more palm tree, though, for a last section of one of the walls and a few finished touches. And Idalia’s not sure how they’re going to buy it. She doesn’t see where the money is going to come from, so she’s planning to talk with her case manager, Titon. She hopes he’ll have some ideas. Building her house has been a struggle. She and her husband haven’t had a lot they can invest in the project. And it’s been hard to make progress even though hers is smaller than those being built by other members. Its only full-time inhabitants are Idalia, her husband, and their youngest son, and they decided to construct only one small room. The couple doesn’t want to remain in Gwo Labou, and they see no reason to invest too much in a house there. They moved there a couple of years ago from Jinpaye, an area of Cornillon farther into the hills above Gwo Labou. They fled Jinpaye, where they have some land and some roots, to escape accusations of theft made against her husband. He was brought up before local leaders there, accused of stealing plantains from someone’s field, and her intervention at the improvised trail only made things worse. “A wife doesn’t speak for her husband,” she was told. But she’s not at home in Gwo Labou. The couple found a member of the CLM Village Assistance Committee willing to let her build her CLM home on a corner of his land, but she’s embarrassed by her dependence on a stranger’s goodwill. And she feels as though her situation gives her an especially low status in the community, which affects her ability to progress. “Yon moun vini mwen ye. Mwen rèt sou tè moun,” she explains. That means, “I’m a stranger. I live on someone else’s land,” and it’s her explanation for a range of complaints, including her sense that her neighbors don’t worry about paying her money they owe her. 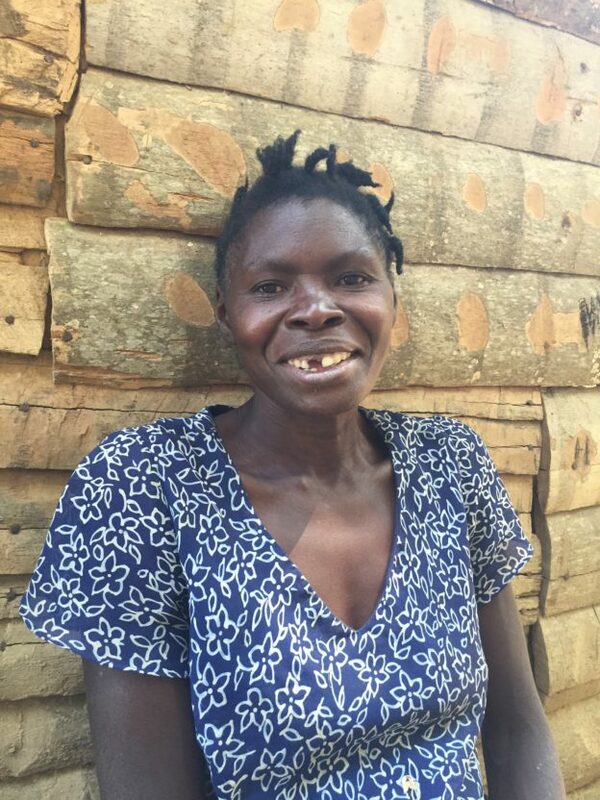 She’s sold both goat meat and pork, but the only money she’s received out of what she is owed is what Titon has collected for her. She has three goats, but they haven’t been productive. One is pregnant, and a second may be. It was just recently together with a buck. But the third has been with her the longest, and it’s not gotten pregnant yet. It is probably past time for her to sell it and buy a replacement. Idalia says that she’s not going to graduate from the program. She says that others have told her that she can’t graduate without poultry, and all the chickens that she has purchased die soon after so brings them home. She just spent 600 gourds, or almost $10, to buy six young ones, but they didn’t last. She doesn’t really have to own poultry to graduate. That is her misperception. Many CLM families have graduated without owning poultry. But we do insist that members develop at least two income-generating activities, and Idalia has only one, the goats, so far. I came across Juslène in a corner of Gwo Labou different from the one I have previously found her in, a couple of hundred yards uphill from the house I’m used to. She and her toddler were sitting under a tree in a neighbor’s yard as she helped the older woman shell a small harvest of peanuts. She no longer lives in her sister-in-law’s house. 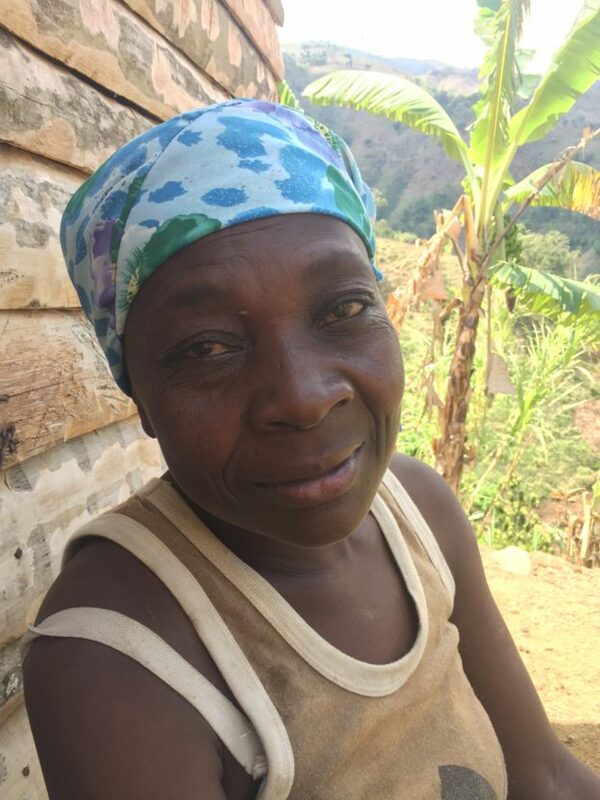 Juslène and her husband have managed to complete enough work on her own home that they felt ready to move into it. All it still lacks is an internal door separating its two rooms. Juslène is delighted. She says that her sister-in-law’s house was too cold. And it’s true that it sits in a small yard surrounded by large trees. Very little sun gets in. But the more important difference is that the new house is her own. “Ou dòmi lakay ou. Lè w vle leve, ou leve.” That means that you sleep in your own home. You get up when you want to get up. 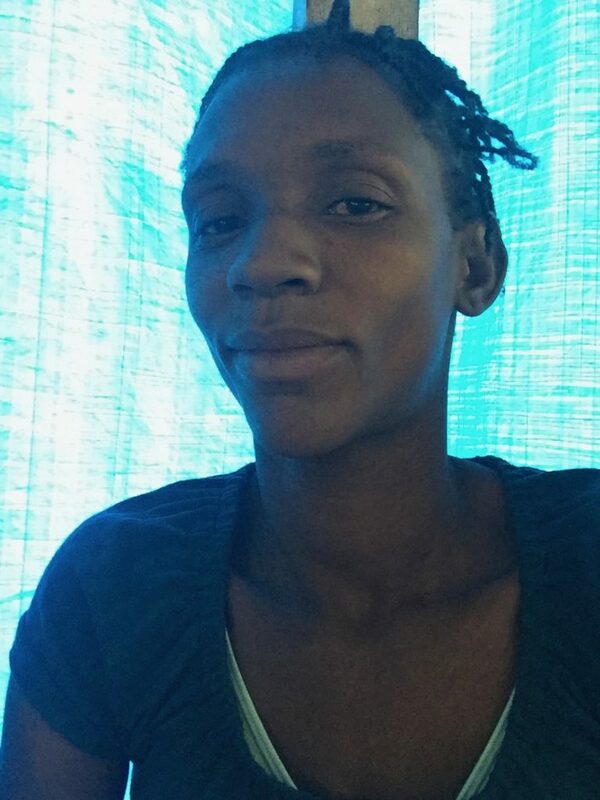 Moving to her own house has given Juslène a new measure of control over her life. 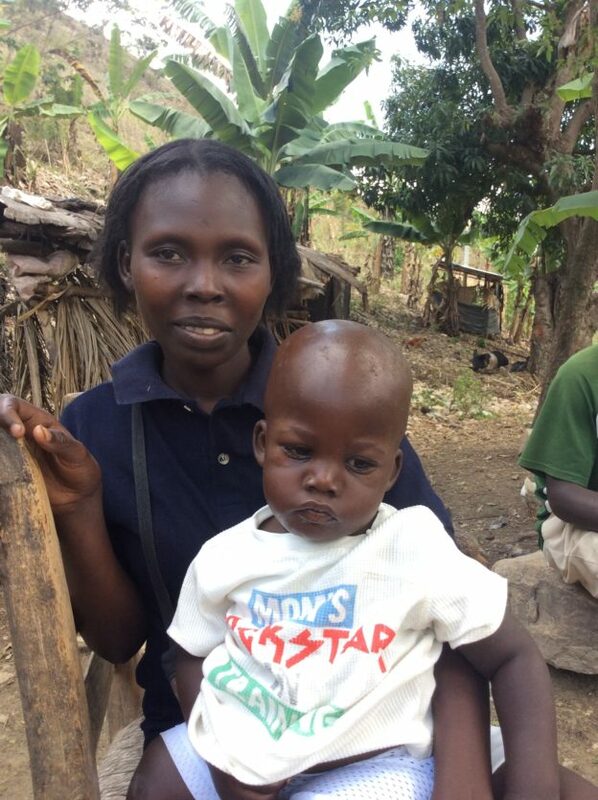 She’s also pleased because her little boy was released from the malnutrition program that the CLM team referred him to. Its medical staff judges that he no longer needs the fortified peanut butter that is the standard treatment in Haiti. And as I speak with Juslène, the boy is noticeably more playful than he has been during my previously visits. He must be two or three, and he is getting chatty. Not yet pronouncing words clearly, but putting out one short, choppy phrase after another. Juslène repeats most of the phrases, correcting pronunciation and adding missing words. She says that talking with her boy is new for her, but she really enjoys it. She learned it from Titon, her case manager. The importance of talking to newborns and young children is one of the CLM program’s key lessons, and Juslène appears to have learned it well. Juslène still needs to work hard to further develop her wealth. She still has just two goats, but they are both pregnant. And she has no reliable source of income. She says that she and her husband still depend on working in her neighbors’ fields, but that means income that is both small and irregular. That’s something that she and Titon will have to work on. But Juslène has changed a lot. Her neighbors wouldn’t talk seriously to her. They looked at her as an “egare.” That means someone who’s empty-headed or lost, out to lunch. Juslène used to spend most of her time looking down when someone tried to speak with her, as though she was afraid to engage in conversation. Now she engages with people comfortably. Titon notices that difference, and so do Juslène’s neighbors. This entry was posted in Chemen Lavi Miyo, The Women of Kolonbyè on October 28, 2017 by Steven Werlin. “Things aren’t moving the way I’d like them to, but they’re moving,” Laumène explains. She’s been struggling with headaches that she still prefers to address with folk remedies, but she continues to work through it all. Two of the children who still depend on her are in school this year. 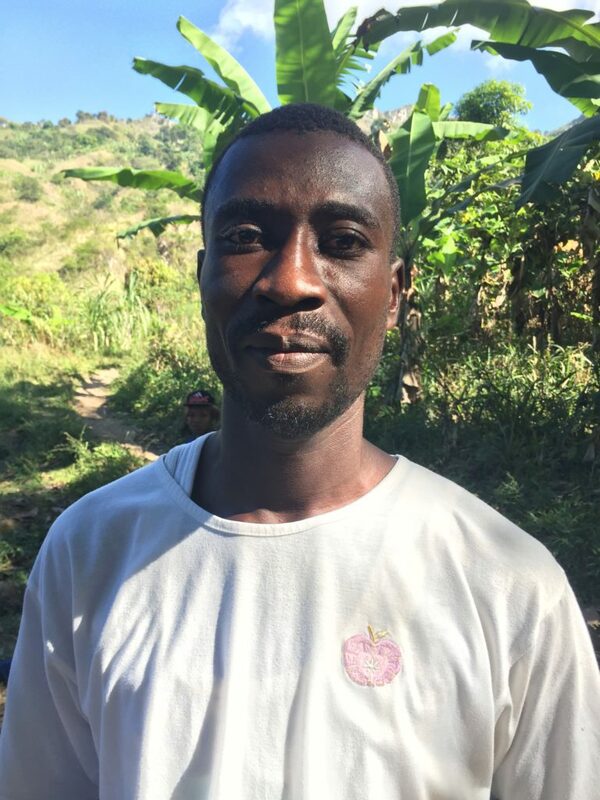 A third would be in school, but he got sick right at the beginning of the year, and he went to stay with an older sister in Port au Prince, who is helping him get treatment. Laumène plans to send him in school starting in January. Another lives in Port au Prince as well, even though his mother thinks of him as her dependent. Her real difficulty is with Elijean. Elijean is 15, and lives with his mother in Gwo Labou. She and the boy’s father sent Elijean to preschool, and Laumène still shows off his diploma with pride. But then the father decided not to pay for the boy to go to primary school. After a couple of lost years, Laumène herself managed to send Elijean. But it was always a struggle. Sometimes she couldn’t pay fees on time, sometimes she couldn’t buy all the books he’d need, and sometimes she couldn’t afford a decent pair of shoes. He would miss time. And the more time he missed, the less interested he became. Now that Laumène could send him he’s no longer willing to go. He prefers to hang around and make little bits of money doing odd jobs. The day I sat with Laumène, for example, I crossed paths with Elijean as I was hiking up the hill to her home. He was lugging a sack full of avocados down the mountain for a neighbor. Laumène worries that Elijean will regret his decision someday. “He’ll see the other young people and the progress they’re able to make.” But she hasn’t been able to get him to change his mind so far. She’s unhappy that her small commerce disappeared. She thinks she was forcing it to do too much for her and her children. “Their father gives them nothing. I’m not his wife.” She started the commerce with money she borrowed from her Savings and Loan Association. She used earnings from it to buy shares at the Association’s weekly meetings. 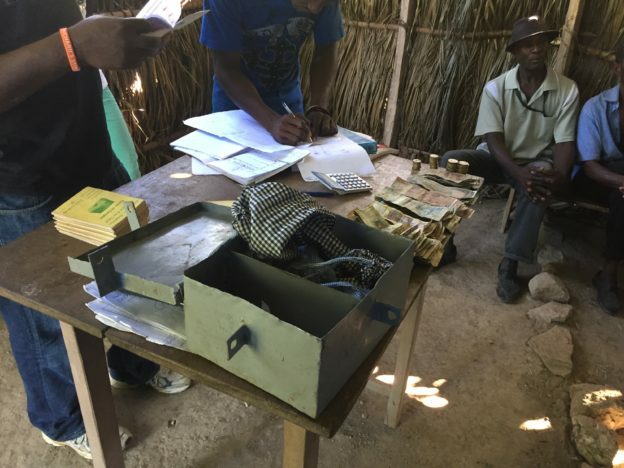 She took some of the money to register three of her kids for school, used 400 gourds to send her boy to his sister in Port au Prince, and a little over 1000 to repay the loan. She has about 500 gourds left, but that’s not enough to stay in the business she had. “I want to set up a rum business, but it’s better if I do it with my own money.” Locally produced rum sells reliably, with a healthy profit margin, because it’s cheap. But she’s worried that if she tries to do it with another loan, she could have problems because drinkers often buy on credit, and you can lack cash when you need it to buy a new supply or make a loan payment. So, she’s waiting for her bean harvest. It should provide her plenty of money to get started. In the meantime, she’s happy about the way that her poultry are multiplying. She has chickens, ducks, and turkeys of various sizes running around her yard. Several are sitting on eggs. She had none when she joined the program. In the absence of her commerce, they give her a reliable way to manage smaller expenses, the sort for which she wouldn’t want to sell off a goat. And the turkeys in particular can help her increase her wealth. Large ones can sell for over 1000 gourds. Selling a couple of large turkeys can bring in enough to buy good young goat. She’s made some progress with her goats. She started with just two, and now she has four, three mature females and a kid. But the kid has been sick. The other kid from the same litter died already. Their mother hasn’t wanted to let them nurse. Laumène is doing everything she knows how to do to save the kid. She holds its mother at times to help it nurse, and she bathes it and encourages it to start eating regular food, but she’s pessimistic about its chances. Her hopes focus instead on the other two females, both of which are pregnant. Her larger concern related to the goats is theft. Theft of livestock in the area around Gwo Labou has become an epidemic. A gang of thieves appears to be making the rounds at night. Laumène calls me to a secluded spot in her yard, right in front of the door to her house, and she whispers that she’s started bringing the goats into her home at night. “They smell, but I’ll put up with it to protect them.” She explains that she bought some extra cleaner so she can to go over the room they spend the night in every morning, and she proudly shows me the room, asking me whether I see or smell any sign of them. She also decided to leave her goat shed in place, even though it needs repairs, so that thieves won’t come look in her home. This entry was posted in Chemen Lavi Miyo, The Women of Kolonbyè on October 26, 2017 by Steven Werlin.